After a migratory existence; living in Baltimore, Lagos, London, New York and more recently San Francisco, British born Singer, songwriter and producer, Siji has emerged bearded and now based back in New York, and in contrast to his newly acquired American permanent residency, with his most African inspired record to date. The album, 'ADESIJI', which features collaborations with noted DJ/Producer(s) King Britt and Rich Medina, is currently scheduled for release in September 2008. 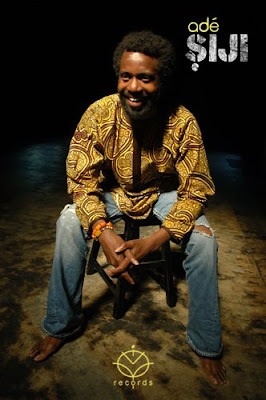 The experience of recording his sophomore album puts Siji on a more mature plane in terms of sound, with layers like a full rhythm and horn section recorded in Chicago and what Siji refers to as “more attention to the‘African’.” The overall sound of the record is still a mesmerizing 'fusion of soul,jazz, highlife, gospel and traditional African folk rhythms'. But, this album ventures deeper into the classical African, 6/8, polyrhythmic groove. This is what defines the album and makes it stand apart. The other character in this story is Gritty 'ol Charm City (or Harm City, as it is more affectionately known), Baltimore, which formed the backdrop for most of the album’s recording and gave Siji a 'proper glimpse into inner-city American life'. Locked away for months on end, Siji was able to tap into something only glimpsed on Television shows like ‘The Wire’. Completing the album and needing to change his environment, Siji sought the warmth of San Francisco and after a brief respite returned to the East Coast. “My self-titled sophomore album 'ADESIJI', is a full portrayal of where I currently stand as an artist and human being and the experiences that have come to shape my character. A few of the songs are about the current war, the environment, my yearning to take a closer peek at my ancestral homeland (Nigeria), where I grew up in as well as the spiritual” side of his roots, said Siji. puts you in a new york frame of jazz mind. I love the music. Absolutely love it. Reminds me of the records (phonographs) that my dad got from the 1970s: 'Ethical Revolution' and several Victor Olaiya classics. He reminds me of several people, actually: Tunji Oyelana, Victor Olaiya, and yes, even Fela ... and also since he's so young, Beautiful Nubia. The new last king of Scotland?